Pay less income tax in future. 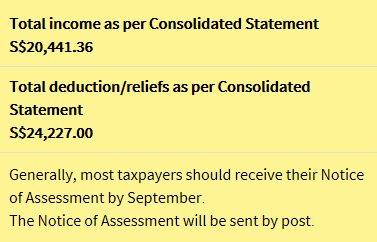 Remember to file your income tax. Taxes are a necessary evil because a country's revenue is from taxes and a country like any modern day entity needs revenue to be viable. So, if we have to pay some taxes, we are contributing to nation building. However, if it is possible for us to pay less income tax, why not? I am talking about doing it legally, of course. As I don't have any significant earned income anymore, I don't pay any income tax. When was the last time I paid income tax? You might want to read it: HERE. Investing for income has helped me to increase my income but not my income tax and you can do it too by creating dividend machines: HERE. Dear AK, if you dont have income, but contribute to your CPF voluntarily, then will you get "flag" by IRAS in that sense no income declared but got $$$ to top-up CPF?? Where do you get the money from? ?